One of my best friends is pregnant and our due dates are just one day apart. It has been so fun to be pregnant at the same time as her, even though she lives far, far away in London. We were talking on the phone a few weeks ago and she asked me if I knew anything about the benefits of eating dates during pregnancy. And honestly, I didn’t know a thing about it! Have you ever heard of this? Since I was driving, I made her read me results from the studies she found online. I was skeptical at first. You hear so many things about what is good and bad in pregnancy that I’m at a point that I question everything. The research on dates during pregnancy is actually really interesting and compelling! The only drawback is that there is not a TON of evidence. But the evidence that does exist is enough to make me eat dates every day these last few weeks before the baby comes. What are the benefits of dates in pregnancy? Eat 4-6 dates a day depending on the size – this should be about 60-70 grams worth. I recommend weighing your dates if you have a food scale so you can figure out how much you should have. I really could not find any reason why you should not eat dates during pregnancy, as long as you don’t have diabetes (since they are high in sugar). So far, in my experience, the hardest part is just finding different ways to eat them. I like dates, but eating several every single day gets a little challenging. Sometimes they taste too sweet, sometimes I just rather eat something else. But if they really do contribute to quicker and easier labor, it’s totally worth it to fight through and eat them. Because honestly, I can think of MUCH WORSE foods to force myself to eat every day! Why do dates contribute to better labor outcomes? Basically, dates appear to help the body’s natural process of preparing the uterus and cervix to be ready for labor and delivery. And, there are SO MANY healthy and delicious recipes that use dates to help you get to that 60-70 grams per day at the end of your pregnancy. I asked my blogger friends to share their favorite date recipes with you. I have compiled an awesome list with their favorites that will give you ideas for anytime of day, for any type of craving you might have! Healthy No Sugar Added Blueberry Muffins (from A Joyfully Mad Kitchen) – these look great for toddlers! Have you ever cooked or baked with dates? Thanks! I add hemp seeds to so mang things and figures it could be an interesting nutritional upgrade for frosting 🙂 Has only worked for me if chocolate though! Thanks for sharing my recipe! I use dates in a lot of my recipes to replace sugar, interesting to know they can help during delivery! So glad to have you contribute! Thanks Andrea! I didn’t even realize how many different ways you can use dates until I made this post! Thank you for including my granola!! Of course! The recipe looks great! Really interesting. Also makes me wonder if dates are contraindicated for women w a history of preterm labor. I didn’t see anything about it in the research but you may be right! Thanks for reading, Chris! 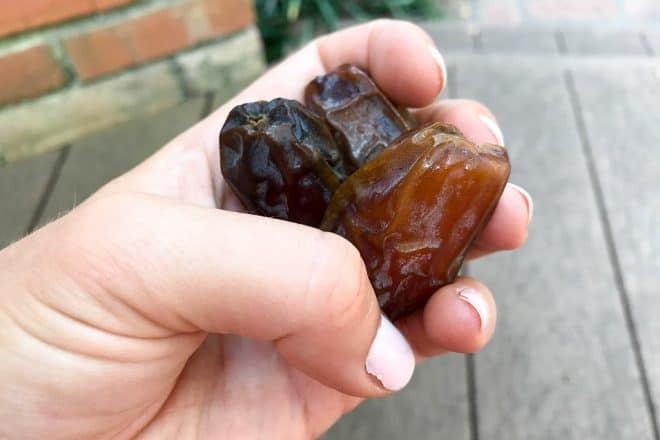 This is the first that I’ve heard about the research surrounding the benefits of dates during pregnancy, but I find it so fascinating! Thanks for sharing and for providing so many wonderful date-filled recipes (and special thanks for including my Carrot Cake Quinoa Bars and Nice Cream Snickers Bars) 🙂 Hope all of the dates you’ve been eating leads to a healthy, quick delivery! Isn’t it so interesting?? I kept trying to find holes in the research since it seemed too good to be true haha. But the evidence they have so far is pretty convincing! And I’m seriously trying your snickers bars asap, they are right up my alley! Thank you so much for including my muffins recipes! I had no idea that they had so many benefits during pregnancy. I’ll be making sure to eat lots of them in a few weeks when I’m in my 3rd trimester!